This product provides a supplemental source of hydrochloric acid, an acidifying compound normally produced in the stomach. Maintaining healthy levels of stomach acidity can help support digestion, absorption, and other gastrointestinal functions. The body’s ability to produce hydrochloric acid may be reduced with age and in certain health conditions. This product should only be taken by individuals who have reduced levels of stomach acid. Hydrochloric acid has several functions that help support healthy gastrointestinal function. In a healthy digestive system, hydrochloric acid (HCl) is naturally secreted to facilitate healthy digestion and absorption of dietary proteins. It denatures protein structure and is needed to activate pepsin, one of the main enzymes involved in breaking down proteins into smaller units. 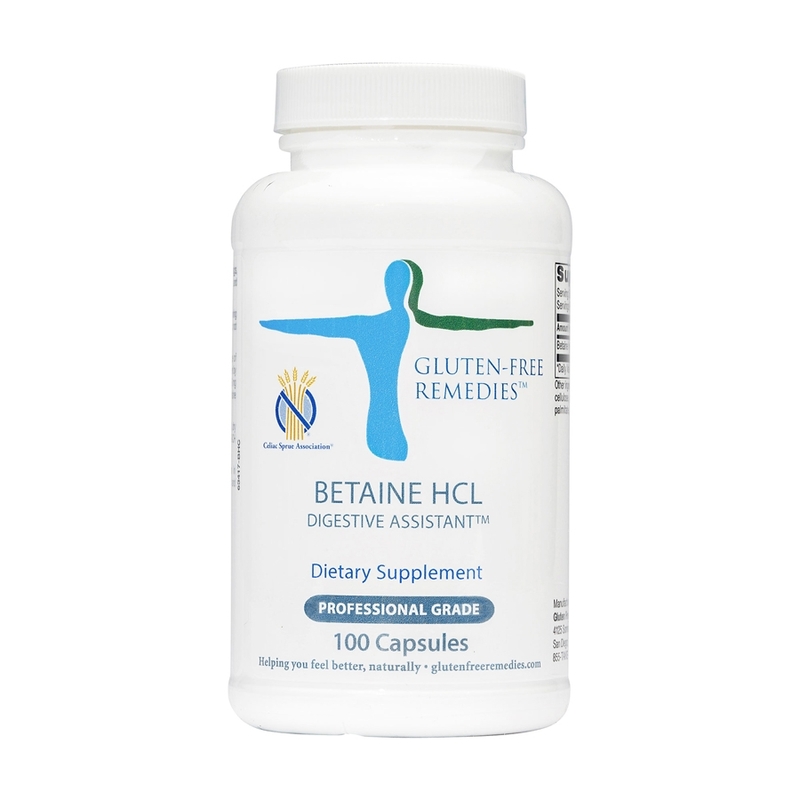 HCl also promotes absorption of minerals and other nutrients and helps stimulate the flow of bile and pancreatic enzymes, which are important for fat, protein, and carbohydrate digestion. The acidic environment of the stomach created by the presence of hydrochloric acid can also play an important role in discouraging the survival of harmful microorganisms ingested with food or water. 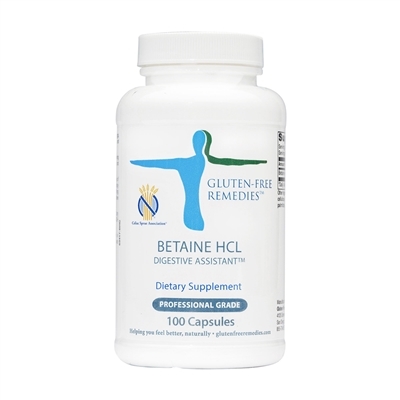 Betaine HCl should not be taken by individuals who have stomach or duodenal ulcers or are taking drugs that may cause ulcers. WARNING: DO NOT TAKE IF YOU are prone to stomach or duodenal ulcers or take drugs that may cause ulcers. This statement has not been evaluated by the Food and Drug Administration. These products are not intended to diagnose, treat, cure or prevent any disease. All information contained on this website is intended for informational and educational purposes only, and is not intended nor suited to be a replacement or substitute for professional medical treatment or for professional medical advice relative to a specific medical question or condition. 1 to 2 capsules at the beginning of each meal. Do not chew or open capsules. Vegetarian capsule (hydroxypropyl methylcellulose, water), cellulose, L-leucine, and silicon dioxide. Free of the following common allergens: milk/casein, eggs, fish, shellfish, tree nuts, peanuts, wheat, gluten, soybeans, and yeast. Contains no artificial colors, flavors, or preservatives. Great company to work with! The staff is extremely helpful, which makes it easy to work with the company and to use their products, which are excellent. I have worked with them for over a year. Unlike other Betaine products, this product has no burning and no acid reflex in the early morning hours. And I have gained weight, so it is working!